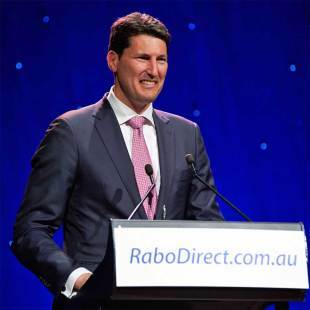 John Eales has joined Melbourne Rebels as a member, urging all Victorians to follow his lead and get behind their Super Rugby team. Eales delivered a passionate speech at the third and final Weary Dunlop Club Luncheon of 2013, the Wallabies and Queensland Reds legend telling 700 guests that the Rebels at their best "are equal to any team in the competition". "If they can deliver that on a regular basis, there is plenty of success to be found here," the Rugby World Cup winner and Australian Rugby Union Board member said. Eales said his heart would remain always with Queensland but he was happy to sign up for a Rebels membership for the 2014 season. "I will always be a Red, having played there for 10 years, but I am proud to get involved with the Rebels and will cheer for them as a member in every game they play - except against Queensland." Eales said that Victorian rugby had improved "in leaps and bounds" during his time involved in the sport, and he backed the Rebels to deliver a platform for Victorians with aspirations of becoming professional rugby players. "As a Wallaby, my first game of rugby in Melbourne was against Italy in 1994," Eales said. "Since then, there have been many momentous occasions for the game in Melbourne, including victories in the Bledisloe Cup and against the British & Irish Lions. Undoubtedly one of the most important moments for Rugby in Victoria was the first game for the Melbourne Rebels back in 2011. I believe that the future for the Rebels is very exciting indeed."